Water Glycol Reservoir, a component of the Apollo Command Module Environmental Control System Water-Glycol coolant subsystem. 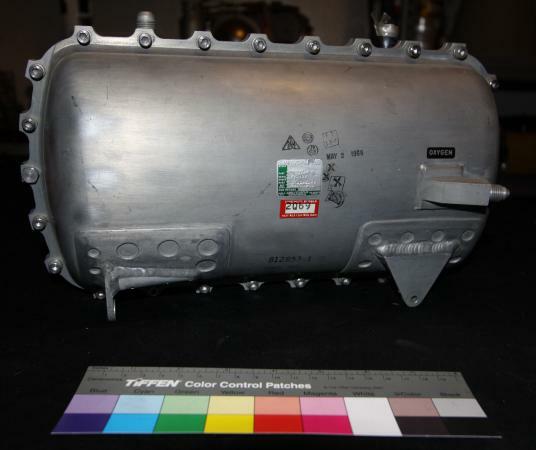 The reservoir supplied coolant to the spacecrafts cold plates (responsible for thermal management of the electronics), spacesuit cooling circuits, Enviornmental Control Unit (for cabin atmosphere conditioning) and the drinking water heat exchanger. The reservoir incorporates an integral rubber bladder and utilizes oxygen (supplied through an external port) as a expellant to feed the coolant into the Water-Glycol coolant subsystem under pressure.